About 125 invited guests gathered for the Aug. 25 official River Run Recreational Project opening, while perhaps proof of the project’s success was the fact that there were dozens of children on the playground and dozens of enthusiasts surfing the South Platte River. Nancy Doty, Arapahoe County commissioner, said during the River Run opening ceremonies the project is an example of great unified cooperation. She said the project became a reality through the efforts of the South Platte River Working Group. The group membership is made up of individuals representing Englewood, Sheridan, Littleton, Arapahoe County, South Suburban Parks and Recreation District, the Colorado Water Conservation Board, Urban Drainage and Flood Control District and the Army Corps of Engineers. The group’s proposals are aimed at creating more recreational opportunities along the seven miles of the South Platte River that run through Englewood, Littleton and Sheridan. River Run is the first major project undertaken and includes a playground, pavilion, trailhead and restrooms set along the eastern bank of the river. Crews have transformed and beautified both banks of the river, and paved trails provide ADA access to the banks of the river, where the chutes create whitewater for tubers, boaters and surfers. Grants from Arapahoe County Open Space fund as well as money Englewood received from the open space fund and from lottery funds provided the roughly $800,000 needed to construct the trailhead. Other river amenity projects are planned or under construction. For example, South Suburban Parks and Recreation District applied for a Great Outdoors Colorado grant to construct a walking and running trail along the east bank of the river from Union to Oxford avenues. The estimated cost of the east-side trail is about $3.3 million. 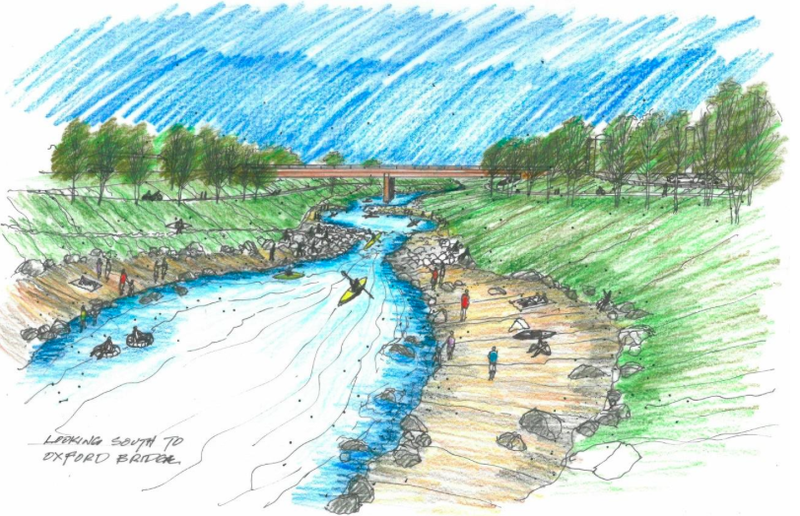 There are plans for bank enhancements along much of the seven-mile stretch as well as creation of a whitewater tubing and boating channel between West Union and West Oxford avenues. Smaller trailheads are planned at Union and Belleview avenues.